HP TouchPad selling poorly at Best Buy, retailers in general? There’s an unsettling truth in the HP TouchPad price drop that we have to face: HP wouldn’t have dropped the price if the tablet was selling well as it was priced. A new report by Arik Hesseldahl of AllThingsD laid bare what we have long (for six weeks) suspected: the TouchPad isn’t selling as well as HP or any of their retail partners would have liked. Staples saw a lot of success with their TouchPad $200-off sale, but it’s likely they only had a few in stock to begin with. 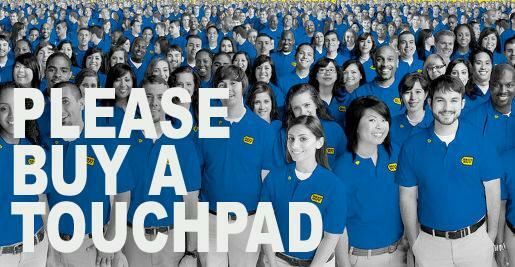 A better barometer might be Best Buy, who has been selling the TouchPad at full price since launch. According to Hesseldahl’s report, Best Buy was sent 270,000 TouchPads by HP, and they’ve only managed to sell 25,000 of them (a number that another source said might be “charitable”). Does that seem like an unreasonable number? Recall the Woot sale of the TouchPad: they sold 612 at $120 off. Woot usually pushes thousands of any one item, HP computers included. Best Buy is reportedly so livid about the sales of the TouchPad that they’re refusing to pay for all of them, instead insisting that HP take them back. A high-level HP executive is supposedly going to be meeting in person with these angered Best Buy executives to smooth things over, but when you’ve got masses of unsold inventory on hand, we can’t imagine that will be a very friendly chat. HP reports their quarterly earnings tomorrow, and if these numbers are true, we expect that they will remain mum on the exact number of TouchPads actually sold. As AllThingsD posited, we expect that if HP’s actually going to give out any numbers for TouchPad sales, it’ll be “channel sales” or “shipped,” numbers that both don’t actually translate to customer sales. Just ask any Palm employee about what happens when you have hundreds of thousands (or millions) of units in excess inventory sitting around. Though, if you go into any Best Buy, chances are you’ll get an example as to why things aren’t going well for the TouchPad: sales rep training for webOS is still in not good shape. You might even go so far as to call it miserable shape. We’ve heard plenty of reports from readers that have visited their local Best Buy only to have a sales rep try to talk them out of buying a TouchPad, because they really had no clue how the thing worked. And then there’s the problem with the TouchPads in stores running a special demo version of webOS that is both full of memory holes leading to serious lag and Too Many Cards errors, as well as unable to be updated to the much more pleasing experience that is webOS 3.0.2. So if you’re HP and sales really are as miserable as this report suggests, what are you to do? Get the training system in order so the sales reps actually know how to sell the device. It’s one thing to not have training on a specific HP laptop for a month or two – the specs speak for themselves and everybody knows Windows. It’s another for your flagship product running a new OS most sales reps, let along most customers, aren’t all that familiar with, to not have extensive pre-launch training. HP, there’s a small part of us that wants you to announce a blockbuster sales number for the TouchPad, but we don’t expect it to happen. And that’s okay, you can’t change the past. What you can change is the future and the now. It’s time to get sales rep training in order and kick up the advertising to the same level of Apple and Samsung. There’s still time to succeed, but the clock is ticking.